Luigi Cascioli suing to force Church to prove Jesus existed! The show hosts will be in the Chat Room for most of the night. Signor Cascioli, author of a book called The Fable of Christ, began legal proceedings against Father Righi three years ago after the priest denounced Signor Cascioli in the parish newsletter for questioning Christ?s historical existence. Yesterday Gaetano Mautone, a judge in Viterbo, set a preliminary hearing for the end of this month and ordered Father Righi to appear. The judge had earlier refused to take up the case, but was overruled last month by the Court of Appeal, which agreed that Signor Cascioli had a reasonable case for his accusation that Father Righi was ?abusing popular credulity?. Signor Cascioli?s contention ? echoed in numerous atheist books and internet sites ? is that there was no reliable evidence that Jesus lived and died in 1st-century Palestine apart from the Gospel accounts, which Christians took on faith. There is therefore no basis for Christianity, he claims. Signor Cascioli?s one-man campaign came to a head at a court hearing last April when he lodged his accusations of ?abuse of popular credulity? and ?impersonation?, both offences under the Italian penal code. He argued that all claims for the existence of Jesus from sources other than the Bible stem from authors who lived ?after the time of the hypothetical Jesus? and were therefore not reliable witnesses. Signor Cascioli maintains that early Christian writers confused Jesus with John of Gamala, an anti-Roman Jewish insurgent in 1st-century Palestine. Church authorities were therefore guilty of ?substitution of persons?. The Roman historians Tacitus and Suetonius mention a ?Christus? or ?Chrestus?, but were writing ?well after the life of the purported Jesus? and were relying on hearsay. Father Righi said there was overwhelming testimony to Christ?s existence in religious and secular texts. Millions had in any case believed in Christ as both man and Son of God for 2,000 years. ?If Cascioli does not see the sun in the sky at midday, he cannot sue me because I see it and he does not,? Father Righi said. Signor Cascioli said that the Gospels themselves were full of inconsistencies and did not agree on the names of the 12 apostles. He said that he would withdraw his legal action if Father Righi came up with irrefutable proof of Christ?s existence by the end of the month. Luigi expected to lose that case in Italy, and he did. He now has filed an appeal to a much higher court not located in the center of Catholic (mafia style) Italy. Listen to the show to hear what he thinks about his chances. This is the first time Luigi appears in the American media! Listen to this audio file from our show announcing the addition of DiStefano. 'Saddam Hussein, Tarek Aziz, Telekom Serbia, Milosevich, Kennedy, Lady Diana, are only some of the most notorious cases in which the renowned solicitors Giovanni Di Stefano and Domenico Marinelli have taken legal action. Di Stefano and Marinelli will attend to Luigi Cascioli's case, now. He is the scholar, former seminarist, author of the book of accusation The Fable Of Christ ? Irrefutable Demonstration That Jesus Never Existed. Cascioli sustains that he has demonstrated, in an unequivocal manner, the "non historical existance of Jesus, called Christ". In september 2002 Cascioli suited don Enrico Righi, parrish priest of Bagnoregio (Viterbo), for ?abusing popular credulity? and ?change of identity?, because the priest wrote in a newspaper, that Jesus was born from Mary and Joseph and lived in flesh and blood. The Viterbo Court, after a long coming and going, filed away the case, even though the priest had not given any acceptable evidence of Christ's existance. Dissatisfied with this decision, Cascioli and his solicitors Di Stefano and Marinelli will address the Strasbourg Human Rights Court. "Law is based upon respect for National and International Legislation" Di Stefano comments, "we leave hypothesis and conjectures for the priests". If this case is reopened it will become of global importance, considering that it would question the very doctrine and foundation, on which is based Christianity and the Catholic Church. It would be a trial in which the ministers of the Church, that is the Vatican, should demonstrate what they have been sustaining for the last two thousand years: that Christ has existed, exhibiting admisible and precise evidence, instead of mere theological or philosophical arguments. For the listeners of the show. I want to add that Luigi has based much of his research in pre-cannonical gospels or proto-gospels. These gospels are ancient writings (much like this new gospel found declaring Judas as an accomplice and not a betrayer in jesus' death). Luigi has spent years of research and unfortunately during the interview, I was a bit confused in the translation of what he had meant. The pre-cannonical or ancient gospels are contradicting to what is in the bible today. Certain gospels have been picked and chosen to be in the bible while others have been thrown out as heresy (as is the gospel according to judas). This shows a blatant and obvious disregard for truth to further an agenda of christiandom as the church leaders wanted it to be. Read the following for further information on teh derivation of Jesus Christ from John of Gammala leader of a band of bandits. Looking forward to this. Suing some one for claiming jesus existed historically.. that's just absolute brilliance. I don't know much about this, but according to a Wiki article, "John of Gamala" is a fictional character in a 19th C book. If this is true, then you guys are promoting a kook. First a plea for rational thought, now this? Sorry, I should have been more specific: I mean, more information on the historical John of Gamala. There just doesn't appear to be any on the web, except saying that he is a character in a 19th C book. Some people think that Casciolo may be confusing him for someone else. I can't believe that Casciolo made him up -- does anyone know where Casciolo got his information from? Was this covered in the interview with him? If you want information on his research, you'd have to read many pre-cannonical gospels, such as the proto-gospel of Jacob, etc.. these have been partially destroyed and only bits and pieces remain. They were also never included in the bible by the people who decided what should and should not go into the bible. We are finding out slowly but surely that these ancient gospels will reveal a different story all together. We are already seeing a change in history with the discovery of the Gospel of Judas Iscariot. Luigi is in the process of writing 2 more books detailing John of Gammala and disputing the facts behind the Maodnna of Fatima. You'll have to wait a wee bit longer for those. Larry, there is no information there that helps me find out about John of Gamala. It reads like double-talk, to be honest. Have you had a look at that link yourself? If you want information on his research, you'd have to read many pre-cannonical gospels, such as the proto-gospel of Jacob, etc.. these have been partially destroyed and only bits and pieces remain. I love reading through those things! But where do they talk about a "John of Gamala"? Any ideas? Or does Casciolo have secret knowledge? They were also never included in the bible by the people who decided what should and should not go into the bible. We are finding out slowly but surely that these ancient gospels will reveal a different story all together. We are already seeing a change in history with the discovery of the Gospel of Judas Iscariot. It sounds suspiciously like conspiracy theory I'm afraid... but unless Casciolo has secret knowledge that other scholars don't have, or has some remarkable new analytical technique (possible I suppose) I'm not sure where he is going to get more out of the ancient gospels than any other scholar. Thanks, but I think I've found out what I needed to know. Thanks for your reply anyway, Larry. But where do they talk about a "John of Gamala"? Any ideas? I think I've found out what I needed to know. Thanks for your reply anyway, Larry. There doesn't appear to be any information about a "John of Gamala". I don't think you guys have asked Cascioli about it, and I guess you aren't interested in doing so either. So the claim will just float around. Either the author has the name wrong, or he is a kook. So I'll wait for the books and see which way it goes. But if anyone has any historical details of a John of Gamala, I'd be interested to read it. Yeah, we heard you espouse willful ignorance the first time Gdon, we get it. You either haven't heard the show, or are letting the "willful ignorance" of it's content show through your posts. No, I'm afraid I haven't heard the Cascioli episode. So, what did he say about his source for information about John of Gamala? Are there references in Josephus, or some other early writer? If you want information on his research, you'd have to read many pre-cannonical gospels, such as the proto-gospel of Jacob, etc.. these have been partially destroyed and only bits and pieces remain. They were also never included in the bible by the people who decided what should and should not go into the bible. "The Proto-gospel of Jacob", eh? OK, thank you. If anyone has any specific references about where Cascioli gets his information from, I'd really appreciate it if you could post it here. I'd like to look into it further for myself. Thank you! "THE APPEAL MADE BY LUIGI CASCIOLI IN THE EUROPEAN COURT OF HUMAN RIGHTS HAS BEEN ACCEPTED - CASE N? 14910/06 CASCIOLI v ITALY"
good, we'll see what happens. If he succesfully wins, this will have HUGE implications. Luigi gets on CNN again, for the first time in a speaking role! View the show here, then come back to discuss it. I'm glad this is making national news. The thing that people don't get is that, this is about an italian law. Luigi has put forth his evidence and is leaving it up to the church to find the burden of proof. If the church cannot do that, then case closed. But they way they try to spin it on this show is they are talking about the frivolity of the case, which is completely irrelevent. They are demonizing him based on a system that is very sympathetic to catholicism. Of course his case was lost in Italy. That's like going to a catholic church and trying to prove jesus didn't exist there...duh...not gonna work. Whether or not his book is a stretch about the non-existence of jesus or not. He has put forth a logical argument, regardless of how he reached it. I read somewhere that the pre or proto-gospels are 3rd century... my rebuttal is that there is NO contemporary literature of JESUS anyway, so how do the critics of Luigi try to use the same argument. If anything it will never be known, however, it is upon the church to unequivocally prove Jesus' existence using many independent credible sources. Plain and simple. Bleh, some guy quoted Josephus, Tassidus (sp) and Paul as evidence. Extreme stupidity, or extreme bias. And probably a combination of both. Reminds me of the stories back during the Salem witch trials where "spectral evidence" was considered evidence. In other words, someone could say they saw the devil whispering in a defendants ear, and this was admitted as evidence! Only stopped when accusations were made against the governors wife, and he responded by making spectral evidence non-admissable. Gee what religion was it that conducted these trials? Wow, it was Christians! Who would have guessed! I would love to see this case win anywhere! The biggest issue here is that the law clearly states that it is illegal to misrepresent someone in a manner that harms others. Now, if ANY lawyer ANYWHERE cannot get a case together showing the implications of Christian belief in the world, then they should probably find another profession. It is about time that someone took this route, however "frivilous" it may be, because at the VERY LEAST it will force the church to attempt to prove its case, even if in the end no real legal precident will be set. The potential implications for having a documented case of the church floundering in this effort, as is what will inevitably happen because this is an impossible effort, is an incredible tool for anyone who is on the side of rational thought. Thank you for the welcome . 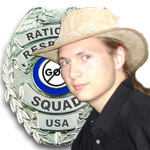 I just recently discovered the Rational Response Squad via Myspace and have been thoroughly impressed with the content I've found here. There's something to be said about the comfort one always feels in the presence of other rational minds that cannot or will not ever be equalled among the throngs of those who claim to be my brothers and sisters in god. Then again, dogma may have given the command to love, but the instructions on how exactly must have gotten lost in translation. Oh, yeah... that's a nice one, apples !!! Oh, by the way... could any of you guys keep the forum updated on the case? I don't even know where to look for information on it, its outcome (if any) etc. I saw john lennon whispering in his ear.